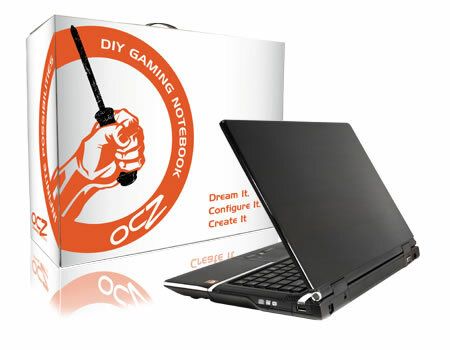 OCZ Technology has unveiled its latest 15” Do-It-Yourself (DIY) gaming notebook based on the Intel Centrino 2 platform. It offers enthusiasts and gamers with incredible options to perfect their own mobile powerhouse. The new 15” DIY notebook able to deliver an optimal balance of gaming performance and portability. OCZ DIY notebook featuring with acclaimed Intel Centrino 2 platform that able it to provides breakthrough in mobile computing for higher performance, advanced connectivity, long battery life and can accommodate the latest CPU technology like all-new Intel Core 2 Extreme mobile processor. Additionally, the 15.4 inch DIY notebooks come equipped with ATI Raedon HD3650 integrated graphics to provide a premium gaming experience that lets gamers power through all of today’s most advanced and graphic-intensive games and application with DirectX 10.1 compatibility.